Last week, 30 students from Alief Independent School District competed in a fun and friendly creative competition. Alief middle schoolers brought their A-games to build the best robot designs for our Think Outside the Box! 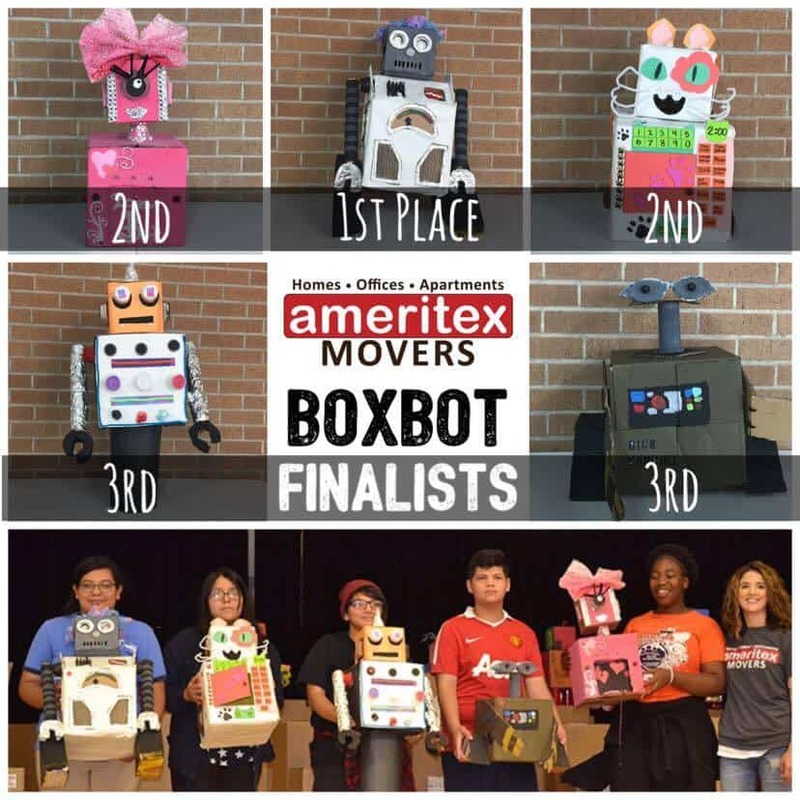 BoxBot Contest. They created awesome robots out of two cardboard boxes and other recycled materials of their choosing. The winners were judged by local community leaders, including representatives from: The Children’s Museum of Houston, International District, Houston Apartment Association, Morgan Group, Wood Residential Services, The Dinerstein Companies, Francis Property Management, Tarantino Properties, Inc. Superb, Greystar, Rockstar Capital Management, LLC, as well as votes from social media. The contest was inspired by our winning entry at the HAA Expo in May. We created an 8-foot-tall model of the Houston skyline out of cardboard. It took four patient team members, over 125 hours, 700 sticks of hot glue, and a LOT of cardboard. The display included famous Houston sights like the GRB Convention Center and Discovery Green. You can now check out the Box City at the Children’s Museum of Houston. Now through Sept. 9 you can find it outside the Invention Convention. The experience of building reminded us of our love for creativity and unique thinking, which we wanted to impart on the future leaders of our Houston community. Additionally, we donated 150 tickets to the Children’s Museum and provided the boxes and prizes for Alief students. We hope this exposure to the arts will inspire students to keep embracing their artistic sides. Overall, we believe it is important to be a positive role model in the community in order to be a good positive influence for the residents and visitors alike. Are You Moving in Houston? If you’re interested in moving to Houston and joining this bustling and creative community, give us a call at 713-484-6683. We love helping new residents call Houston home. Fill out the form above for a free moving quote, whether you’re moving homes, apartments, or offices.